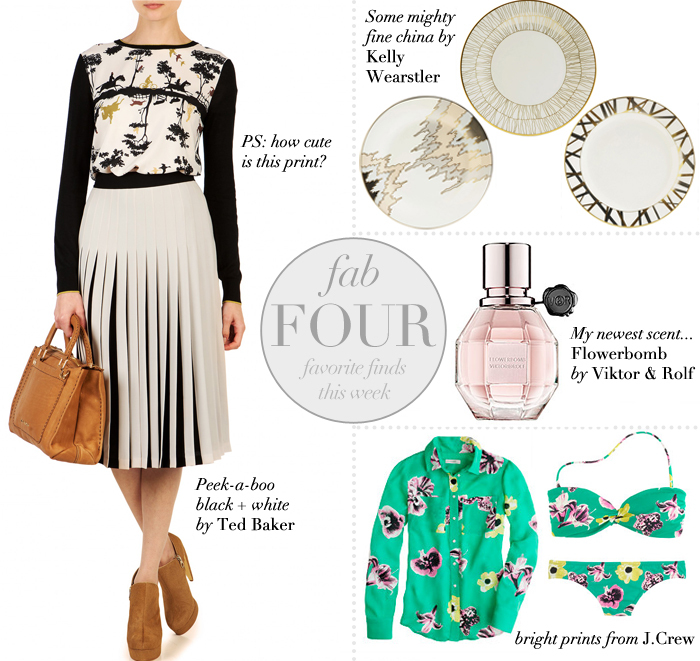 Ted Baker has some super cute pieces for spring – I’m loving this peek-a-boo black + white skirt. Great for work and looks comfy! Also the print on that sweater is super on-trend. Am I the only one who didn’t know Kelly Wearstler designed fine china? I’ll take all of it please (but gimme this one right now). On my way back from that quick trip to Mexico last week, I still had some pesos to spend so I purchased a new fragrance, Flowerbomb, by Viktor & Rolf. It’s now a daily go-to. Finally, with J.Crew’s amazing new arrivals and sale over the weekend, I had to get a bite out of this gorgeously green, pink and yellow floral print. Isn’t it great as a blouse and bikini? Which would you pick? I’ve heard multiple good things about Flowerbomb — I’ll have to give it a sniff next time I’m shopping. And I love that J.Crew print! The pants do it for me the most, but the bikini is a close second! Where is the pretty print top from?